Experience a unique African safari in the heart of the Thornybush Private Game Reserve, part of South Africa’s greater Kruger National Park. Set off on foot and in open off-road vehicles with expert rangers and trackers to see some of the 147 mammals, 114 reptiles, more than 500 bird species and nearly 350 tree species! Experience tailor made game drives and bush walks then return to the luxury of Thornybush Game Lodge. Nestled in the heart of big five country adjacent to the Kruger National Park, with a huge diversity of mammal and bird species, lies over 14,000 hectares of pristine African Bushveld, that is the Thornybush Nature Reserve. It is here that a superlative safari destination, the elegant and exclusive 5-star Thornybush Game Lodge awaits discovery by the discerning traveller. Thornybush Game Lodge is the personification of perfection. Nothing is spared in the attention to detail. Enjoy exciting dawn and dusk safaris in open game vehicles and on foot, take a moment to browse in the intimate library or simply relax at the pool with your favourite cocktail as you bask in Africa's glorious sunshine or while away the moments in our Thornybush Spa. Unrivalled big game viewing is complemented by exquisite accommodation and sublime cuisine. The 20 luxury suites each with private indoor/outdoor showers and viewing decks, overlook the seasonal Monwana River and offer an unsurpassed, 5-star luxury, wild encounter with seclusion and elegance, a seamless experience. Sweeping vistas can be enjoyed over the African Bushveld and ever-active water hole. Superb attention to detail and highly personalized service make for a memorable stay. Elegant and exclusive, Thornybush Game Lodge offers the complete package for individual guests, family holidays, corporate getaways, small groups or wedding extravaganzas. Exhilarating dawn and dusk safaris, an exclusive on-site spa, gourmet cuisine, the world’s finest wines and sublimely luxurious accommodation await the discerning traveller at Thornybush Game Lodge. A fully-equipped conference centre for sixty delegates completes the picture. Up to forty people can be accommodated in air-conditioned luxury at Thornybush Lodge, in eighteen luxury suites and two generously proportioned family suites. The luxury suites are superbly equipped and furnished in the lavish style befitting this five-star lodge. Calming, muted tones and dark wood are used throughout to enhance the tranquil atmosphere of your surroundings, and the furnishings and accoutrements are of the highest standard. The en-suite bathroom features a double basin, large bath overlooking the savannah, indoor and outdoor showers. All the suites have private wooden decks, with comfortable seating, overlooking the reserve and waterhole. Here you can take some time-out to gather your thoughts, catch forty winks or update your journal while enjoying the benefits of fresh air, sunshine and peaceful surroundings. The family suites feature a private plunge pool on the deck. Another extra in these units is the lounge which has a sleeper couch to accommodate two children. These large villas cater for a maximum of two adults and two children younger than twelve, or three adults. Apart from being more spacious, the family suites are furnished and decorated in the same opulent style as the single suites. A number of activities are arranged for children at Thornybush Game Lodge, sign your kids up for the ‘Ranger in Training’ program when booking your accommodation, and they will enjoy fun educational activities throughout their stay. Experience a unique African safari in the heart of the Thornybush Private Game Reserve, part of South Africa’s greater Kruger National Park, on foot and in open off road vehicles with expert rangers and trackers. This game viewing paradise is home to 147 mammals, 114 reptiles, more than 500 bird species and nearly 350 tree species – tailor make game drives to seek any of these or all of them. Thornybush is a haven of life and inspiration! Five star lodge architecture and facilities make sure guests can both be social and escape the crowds for peace and meditation. 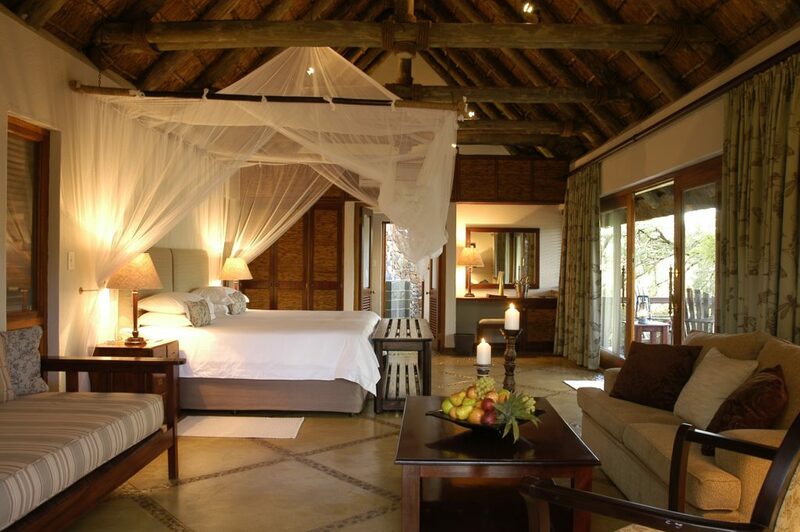 Self-sufficient accommodation in luxury suites provide romance and comfort to all who stay at Thornybush Game Lodge. Weddings and honeymoons are big here because every need is catered for by caring staff and every sense sharpened in the perfect natural setting. Not only is Thornybush family-friendly but so too does it offer a friendly space for businessmen, being home to a top notch 60-seater conference centre close to all facilities. Including the pampering spa with its choice of world class beauty treatments! Accommodation in true South African safari style features two family suites comprising lounges with sleeper couches, large private decks and inviting plunge pools. There are also 18 stylish air-conditioned suites overlooking the Monwana River. Picture deluxe en-suite bathrooms, inside and outside showers and private decks, allowing the bushveld sounds and smells to venture inside. A typical day in Thornybush Game Reserve starts with coffee and rusks, followed by a morning game drive and maybe a walk, then more coffee and rusks. Back to the lodge for a full English breakfast or maybe enjoy the setting of a dry riverbed? Big 5, Birding, Flora, Leisure, Nature, Relaxation, Wildlife, And more.